Just in time for Easter. 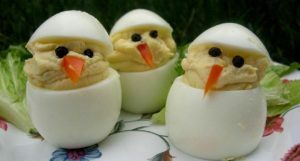 The kids will love this fun and tasty snack for Spring. Hard boil the eggs and let them cool completely. Peel the eggs. Cut a small amount off the rounded, larger end so that the eggs sit flat on the counter. 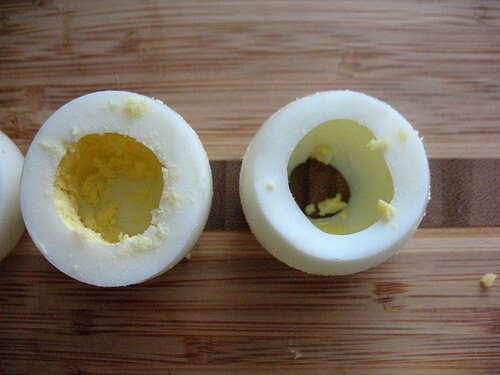 Don’t worry if the egg appears to not have a solid bottom, the filling will be stiff enough to stay in the egg. Next cut about 1/3 of the way through the thinner, rounded end of the egg. 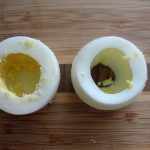 Carefully scoop out the hard cooked yolk into a bowl or push it out through the larger end. Stir in the mayonnaise, yogurt, mustard, salt and pepper until smooth. Using a sandwich bag as an ‘icing’ bag, pipe the egg yolk back into the eggs. You will need to mound it a bit at the top to form the heads of the chicks. Cut a tiny triangle out of orange pepper and press on the front for a beak, then add the peppercorns for eyes. Press the top on for the top of the egg. Put them on a plate and serve!